Abbos Kosimov is widely appreciated as an international phenomenon; through his dynamic performances He is recognized globally as a master of dorya and an ambassador of Uzbek culture. Abbos was born in Tashkent, Uzbekistan to a highly musical family. As a youth, His older brother, Umar Kasimov, introduced Abbos to the honored Uzbek doyra artist Tuychi Inogomov. In 1980 His father, Rakhmat Kosimov, enrolled him to this music school where he graduated in 1985. He also attended the doyra school of the famous doyra musicians Brothers Islamovs. In 1988 Abbos graduated from the College of Culture and Music under dorya master Mamurjon Vahbov. In 1991, He won second prize in Central Asia and Kazakhstans Competition of Percussive Instruments. Following college graduation Abbos completed his higher education at the Tashkent State Institute of Culture in 1994. He has recorded independently as well as with R&B singer Steve Wonder and with Zakir Hussain for the soundtrack of Alonzo Kings new Lines Ballet piece A Thousand and One Nights which premiered in Monte Carlo in November 2009. Most recently, in March 2010 Abbos performed at Carnegie Hall with Kronos Quartet, Dohee Lee, Homayoun Sakhi and Alim Qasimov Ensemble. In 2009, He was awarded the Alliance for California Traditional Arts (ACTA) Apprenticeship grant to teach dorya rhythms as a master artist and mentor to Central Asian dancer and mentee Tara Pandeya. Following his participation in ACTA apprenticeship, He co-founded the non-profit group East West Centerpoint with artist Tara Pandeya to promote the arts and cultures of Central Asia. The organization strives to build dialogue, interest, tolerance and cross-cultural understanding between the Eastern and Western cultures through the preservation and development of Central Asian performing arts, education and research. In 2008, He produced an instructional DVD on the doyra and in 2009 he authored a book on dorya performing arts, both of which are available for sale through this website. 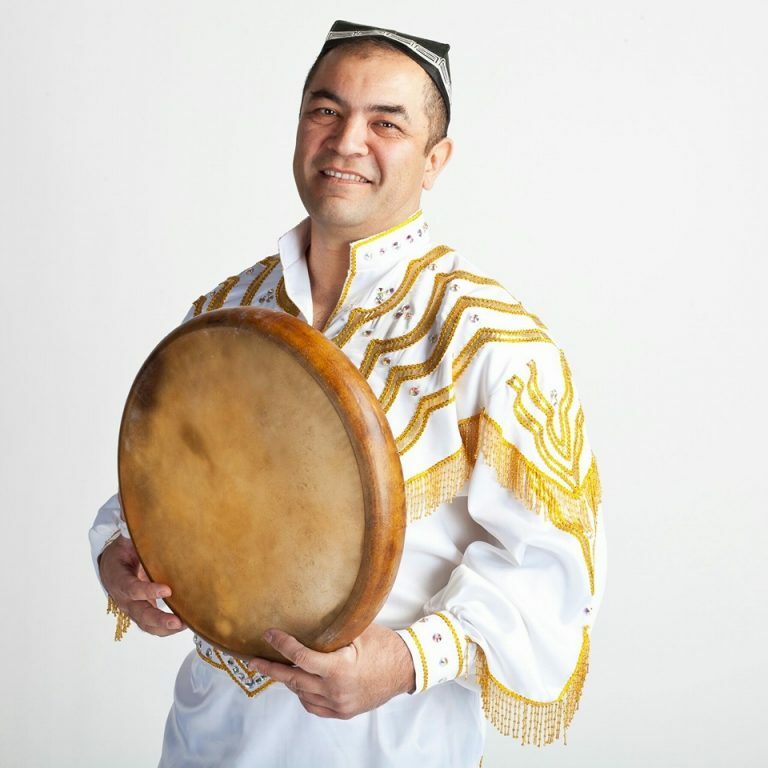 He is currently working on composition for many exciting new upcoming projects and has dedicated his life to preservation and development of Uzbek percussive arts. In the same year, He was the recipient of Best Musical Composition award from the prestigious Isadora Duncan Dance Award for his biopic2collaboration with dancer Tara Pandeya at the 2007 San Francisco Ethnic Dance Festival. In 2005, Abbos moved to the United States and he has since performed with artists such as Randy Gloss, Austin Wrinkle, Houman Pourmehdi, Andrew Grueschow, Adam Rudolph, Zakir Hussain, Giovanni Hidalgo, Terry Bozzio, Swapan Chaudhuri, Alim Qasimov, Kronos Quartet, Homayun Sakhi Trio, and Omar Sosa at the World Music Institute. From 2001 to 2005 Abbos successfully participated in numerous international festivals, concerts and university workshops in the United States, Canada, England, Jordan, Syria, Egypt, The United Emirates, Austria, Italy, Japan, Germany, France, Belgium, Luxemburg, Greece, Bangkok, Taiwan, Australia, India, Malaysia, Russia, Azerbaijan, Kazakhstan, Tajikistan and Kyrgyzstan. In 2001, in honor of the 10th anniversary of Uzbekistan’s Independence Abbos was awarded with a medal and given the illustrious title of Honored artists of Uzbekistan by the president Uzbekistan. In 1994, Abbos established his own “Abbos” school where he taught the most talented youth of his country to play doyra. At present time there are more than 100 students in his school of doyra. From 1994 to 1998 he worked as a teacher in Tashkent State Institute of Culture. In 1998, he established the “Abbos” group that featured national music instruments such as karnay, surnay, nogara and qayroq. The group is very popular not only in their country but also abroad.